Billy Graham died last year and and saying goodbye to a earthly hero one who has changed the world leaves one sad but hopeful–sad because our leader is no longer here, hopeful because we know God is going to do something major. I have been praying, reflecting and asking the question, What’s next for the world? Who will take up the mantle? God is indeed a good God. Natalie’s new devotional book “52 Cups Of Coffee” is finally here and ready for purchase. As Natalie says in the book. Life is loud. Every day we are bombarded with the noise of simply being alive. In the midst of it all, it is easy to forget the voice that matters most. Throughout the Bible, God often captures the hearts of people through the realm of storytelling. From parables to passed down tales among the generations, we are called to see that God is the same yesterday, today and forever. 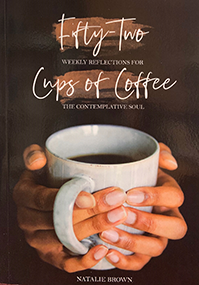 52 Cups of Coffee: Weekly Reflections for the Contemplative Soul is a call to listen, reflect, and respond. Through personal storytelling, honest insight and Biblical analysis, this book will surely awaken your senses to the sounds of hope. Within the life of Joseph we find many “why” questions. Why did God allow Joseph to be sold into slavery and then sent to prison for a crime he did not commit? Why didn’t one of Joseph’s brothers confess their evil deed against him to their father? Why didn’t God reveal to Jacob in a dream or some other form that Joseph was still alive? The list can and does go on. In the same token, we might also question why God allows difficulties to come into our own lives? To be honest, we won’t have answers to all of these questions but we can rest assured that God sees the big picture. God had a plan for Joseph. Satan obviously knew there was something special about Joseph so he tried to destroy him. Happy 4th of July to all my friends and family in America. Lets continue to pray that God would guide, bless and protect this incredible land. Here are two videos of the hymn Battle Hymn of the republic. One is the end of the regular version and the other is the Jazz version of the chorus we call Glory Glory. You can share these with your friends.